The BEST Restaurant Style Steak EVER. For as long as I can remember Saturday has always been steak night for my family. This tradition goes way back starting with my Grandpa and still lives on through my dad. When I was little I loved tying back my little yellow apron, pulling up my step stool near the grill and helping Grandpa cook some steaks. And on Saturday nights I would do the same at home with my daddy. So growing up we ate a lot of steak. When we go home to visit we are always guaranteed a steak dinner. Although we love steak, Matt and I haven’t carried on the weekly tradition in our home. Instead we save it for special occasions. Valentine’s Day happens to be one of those occasions for us. When I first started whipping up this steak I was scared to tell my dad that I don’t use the grill. Gasp! Instead I briefly sear the steak in a skillet and then toss it in the oven for a few minutes. Voila — the best steak you’ll ever eat. But shhh, don’t tell dad. Super fresh ingredients are in part what make this steak so delicious. So don’t dig through your spice drawer for the thyme and parsley. You must use fresh ingredients if you’re looking for the best steak of your life. I repeat, do not skip any of these steps or substitute any of these ingredients! We normally pick up our steaks from the Harris Teeter. 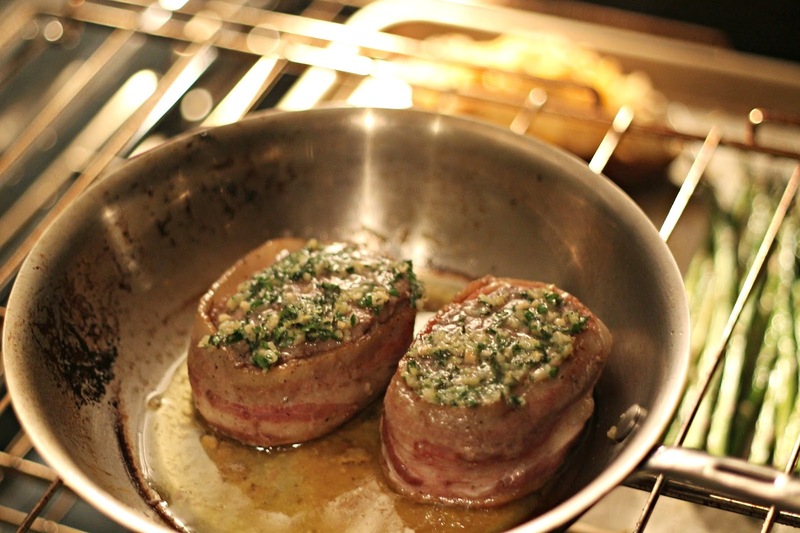 However, one of Matt’s clients surprised him with bacon wrapped filet mignons from Omaha Steaks so we were excited to sear these suckers up. A beautiful log of delicious compound butter. 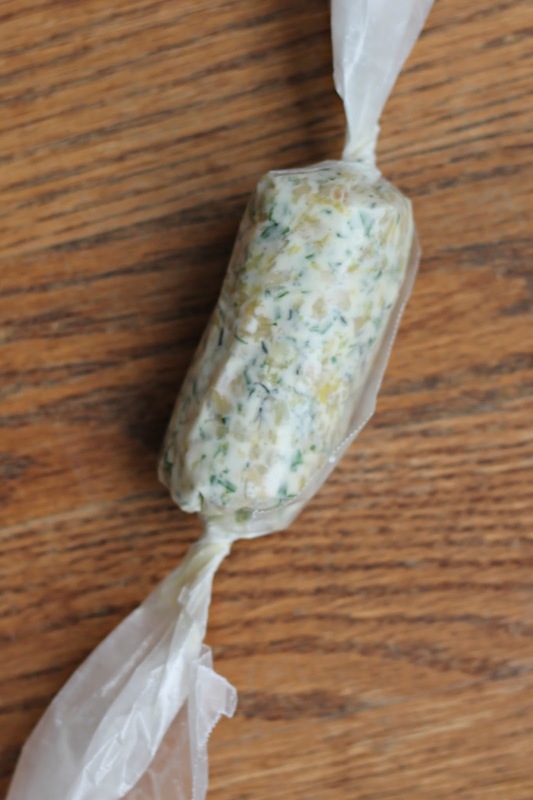 By the way, to form into a log, I drop the mixed butter onto wax paper and twist it up. Easy. If you become as obsessed as I am about this butter, feel free to add a little more on top at the end! Mix together half the butter, herbs and lemon zest. Form into a log and refrigerate. Heat the remainder of the butter (1/2 stick) and the olive oil in a skillet to a screaming hot temperature. In the very hot skillet, sear the filets for about 2-3 minutes per side, or until a nice brown crust has formed. While the steak is searing, continuously spoon the residual butter in the pan on top of the meat. Once both sides are seared, place skillet in oven for about 6-8 minutes for medium rare temperature. Increase time for well done steak. In the last minute of cooking, take the log of compound butter and slice a nice thick piece to place on top. Your steak will be ready when it is approximately 135 degrees in the center, or when you push lightly on the top center of the steak and it gently and slowly bounces back. I just saved this post! We like to occasionally have a steak and we love being able to cook it in the house. Your method looks a lot more failproof and delicious than what we have been doing! And don't even get me started on that log of butter. All the heart eyes. This looks amazing! Similar what we do but I've never tried fresh herbs, so will have to see how that makes a difference. Thanks for sharing!! WOW! These look so tasty!! 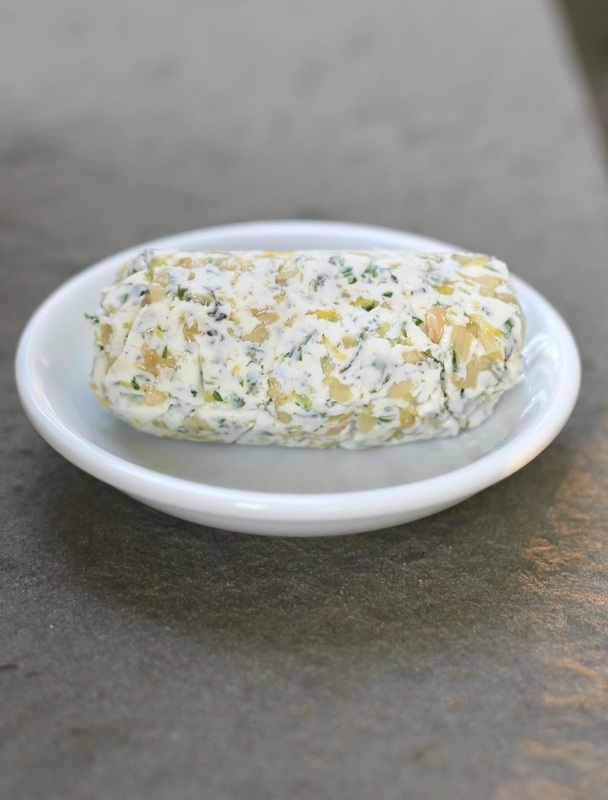 I love making butter with fresh herbs… so tasty on bread, too! 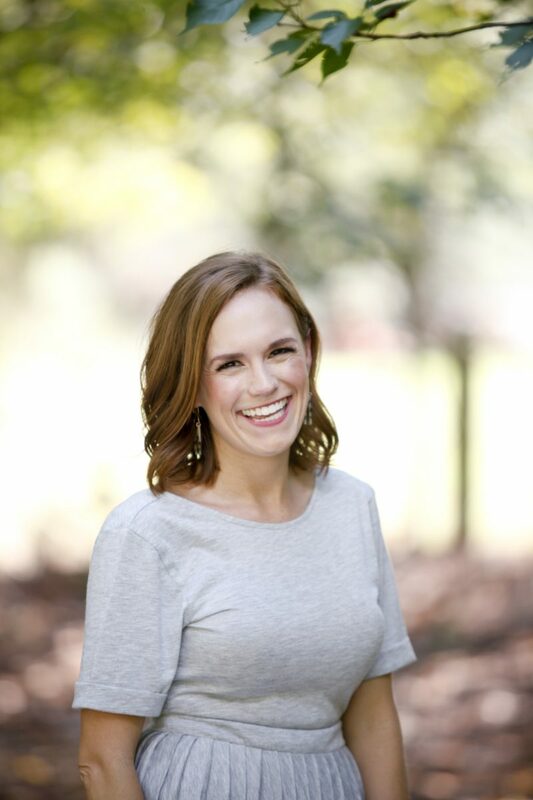 I love that your family has that tradition – so fun! We are huge steak lovers but very rarely make it at home – that would be such a treat! This one looks so tasty and the log of butter, yes! Can't wait to try this! This looks amazing! We do big stead dinners for special occasions also and normally they're on the grill. I'm totally trying this for next time! 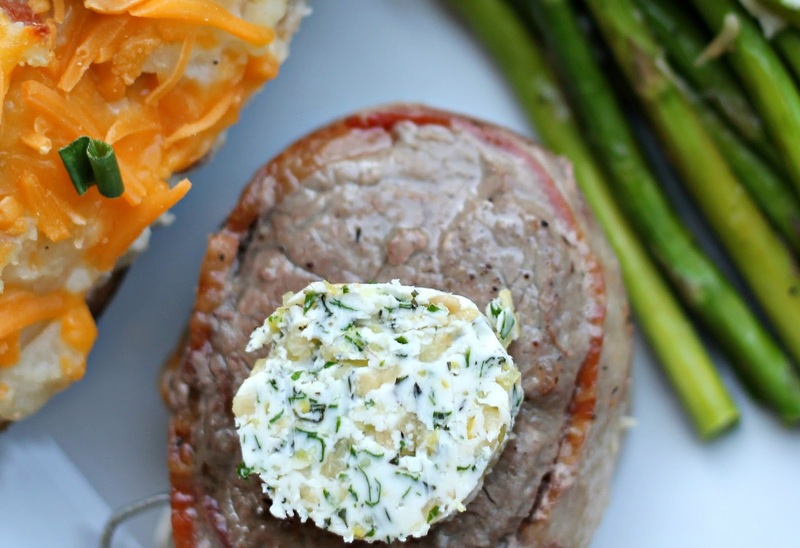 I'm all for this style of steak too so it often comes down to a battle of my way or the hubs'- who is a die hard "steaks must be grilled" guy haha But we agree on one thing for sure and that's that the butter is the key to a yummy steak! My mouth is LITERALLY watering. 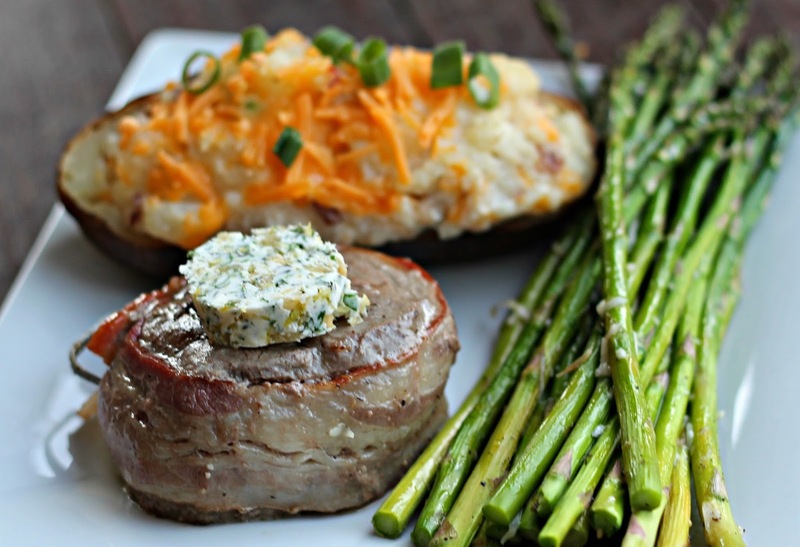 Hubs and I love some good filets… all of our date nights involve a restaurant with a good filet mignon. I've never tried to make them at home, but I love the idea! I am so trying this! Looks so darn good! These look so yummy! I love a good steak! can i bathe in that log of butter please???? That steak looks delicious! I don't know if I could handle steak every week, phew! 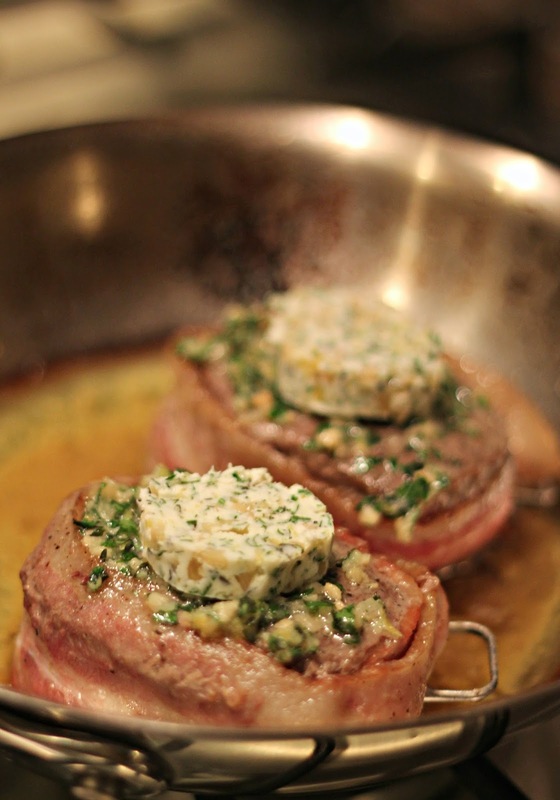 I have never tried to make steak at home but these look SO delicious. I'm drooling! I shared with my boss and he got so excited lmao! Trying this tonight actually. I love the butter log idea! How simple and delicious from the looks of it.